Another important milestone was reached recently for TSMC and ARM when the teams taped out at the end of December 2013 (see block diagram) the first 64 bit ARMv8 processors in a big.LITTLE configuration on TSMC’s leading edge manufacturing process, 16nm FinFET. Why is this important? Not only is this the 2nd tape out under TMSC and ARM’s multi-year, multi-node collaboration agreement, which dates back to early 2012, but it yet again proves that best-in-class solutions for TSMC’s Open Innovation Platform® (OIP) can be achieved. Additionally the combination of big.LITTLE processing in a leading edge FinFET process will continue to ensure the TSMC/ARM partnership will set the pace on delivering new experiences available on mobile devices. This subsystem, which contains ARM’s dual Cortex-A57 and quad Cortex-A53, was a result of a close collaboration between TSMC’s R&D division and ARM’s Hsinchu Design Center (HDC). The success of an earlier tape out which contained a single core of Cortex-A57 led to a more complex test chip that reflects what a TSMC customer might design, namely a big.LITTLE processor based SoC. 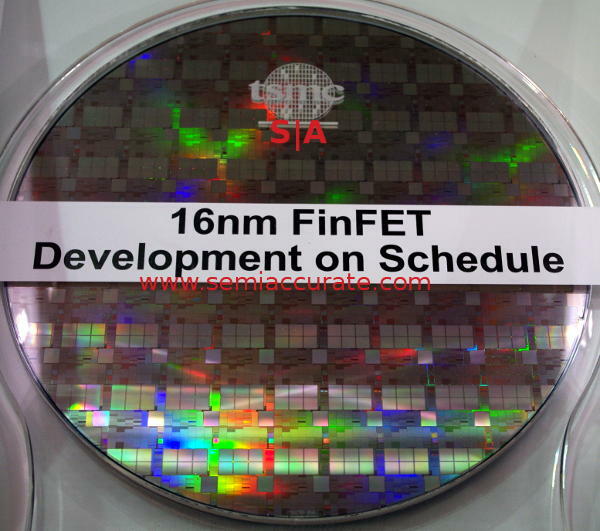 TSMC’s 16FinFET process offers significant improvement over 28HPM for high end mobile computing and networking. Since designs could gain >40% faster speed at the same total power, or alternatively reduce >55% in total power at the same speed over 28HPM, it made sense to use this process to implement a more complex test chip with ARM’s Cortex-A57 and Cortex-A53. The result is a solid proof point of TSMC’s most advanced process technology and ARM’s most advanced processors ahead of other foundry competitors. This provides TSMC’s OIP as well as ARM ecosystems partners access to the FinFET technology from TSMC, the trusted technology and capacity leader. The combination from TSMC and ARM will offer the best value for an optimized speed/power solution to meet next-generation product requirements in networking and mobile computing applications. As previously announced in January, TSMC will have more than 20 customer tape-outs in 16FinFET during 2014 - we look forward to seeing these parts come to market! Innovation is continuing at TSMC with the development of enhanced 16nm FinFET (16FF+) process that will offer an additional 15% performance improvement with no power or area penalty. What is really cool is that at MWC, the ARM booth had a TSMC 16nm FinFET wafer on display! TSMC continues to deliver next generation process technologies like clockwork. The excitement around 16FF+ is already building in the ARM Partnership. Foundry investment in the physical design ecosystem is one of the reasons the fabless industry is working. BTW, TSMC is investing in More-than-Moore technologies as well providing even more opportunities for innovation and diversity from the ARM Partners.